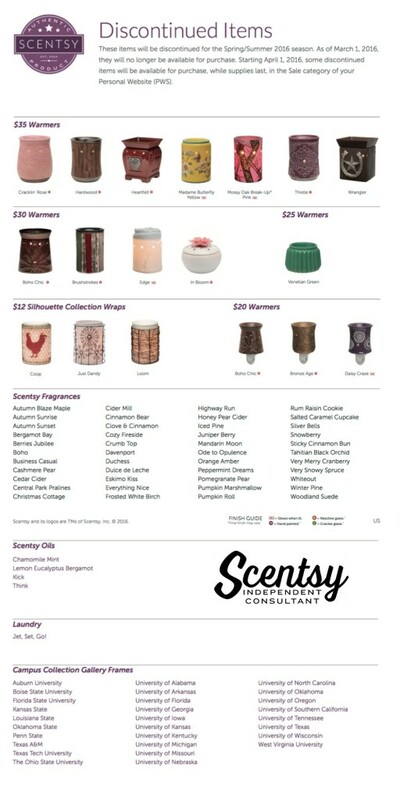 The discontinued Scentsy list is out! Order these discontinuing Scentsy products in February 2016, before they’re gone. Our new Scentsy Spring Summer Catalog 2016 has been released for sneak peak, and will be available to order from soon. In order to make room for all the fun new springtime Scentsy products, we need to discontinue our current Fall inventory. That includes Scentsy warmers, fragrance scent bars, Scentsy Essential Oils, etc. Check out the list below and if your favorite products are listed, better stock up now on your favorite Scentsy products! Are there quite a few of your favorite scent bars listed to be discontinued? Order a multi-pack where you can buy 5 scent bars and get one scent bar FREE!